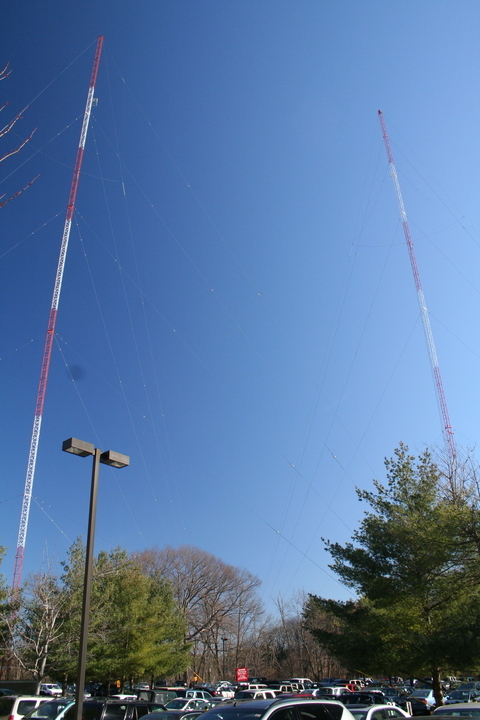 These are WRCA's current towers, overlooking the office-park parking lot at 750 South Street. There used to be three towers here, but when the 1330 New York City/Troy share-time situation was resolved (with Troy becoming a daytimer), 1330 Waltham was able to drop a tower (and with it a night pattern which protected a station on the air for only a few hours a week). A few years back, one of the towers collapsed while its base insulator was being replaced. I don't remember which one it was.